لاژس, کلر. (1394). خوانش شهر به روایت خیابان؛ تحلیل پیچیدگی خیابان در تهران. مجله علمی-ترویجی منظر, 7(30), 70-81. کلر لاژس. "خوانش شهر به روایت خیابان؛ تحلیل پیچیدگی خیابان در تهران". 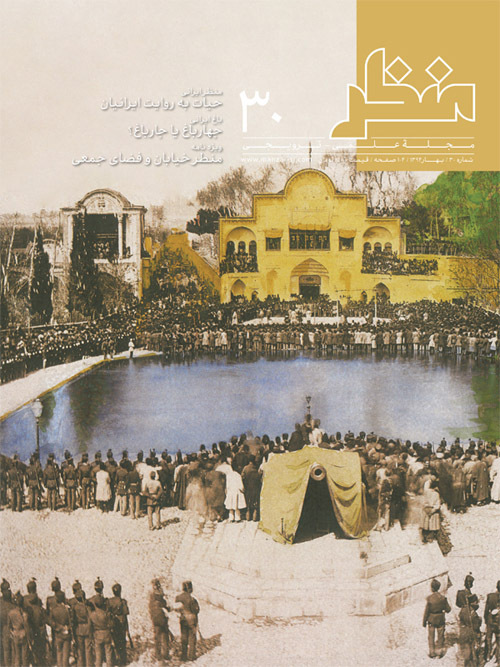 مجله علمی-ترویجی منظر, 7, 30, 1394, 70-81. لاژس, کلر. (1394). 'خوانش شهر به روایت خیابان؛ تحلیل پیچیدگی خیابان در تهران', مجله علمی-ترویجی منظر, 7(30), pp. 70-81. لاژس, کلر. خوانش شهر به روایت خیابان؛ تحلیل پیچیدگی خیابان در تهران. مجله علمی-ترویجی منظر, 1394; 7(30): 70-81. شهر، امری پیچیده است که توصیف جامع آن غیر ممکن به‌ نظر می‌رسد. از آنجا که شهر ترکیب متنوعی از کل‌های در تعامل را در خود جای می‌دهد، شناخت آن‌ با یک مطالعه ساده ممکن نیست. لذا در این نوشتار، جهت ارائه یک تحلیل از شبکه معابر، عینیت پیچیده خیابان، تنها با داده‌های هندسی1 بدست آمده از شبکه راه، تحلیل شده است. این داده‌ها که به ‌صورت گراف2 به نمایش درخواهد آمد، به شناخت بهتر ساختار فضا منتهی می‌شود. چهار شاخص اصلی عینیت مذکور یعنی اتصال، دسترسی، فاصله و پیکره، امکان دست‌یابی به سلسله ‌مراتب میان راه‌ها و زیرمجموعه‌هایی را ایجاد می‌کند که موجب آشکاری فرآیند پیدایش شکل شهرـ مورفوژونِز (Morphogenèse) می‌شود. سایت مورد مطالعه در این مقاله محله‌های مرکزی شهر در منطقه شهر تهران است. The city is a complex object whose exhaustive description is impossible. It is combined of diversity of interactive entities, which are impossible to be included all in the same formalization. The street network is one of the most permanent elements of the city; it is also one of those with the most information about the space structure. In contrast to the buildings and parcels, network’s time transformation scale is more important. Thus, this element is capable to keep a record of construction history of the space and its use. Therefore, we decide to attach ourselves only to the geometric information provided by a network of streets. Represented in the form a graph, it will support to the understanding of space structure. Allowing further analysis of this network, a complex object - the way – is made from its own geometric properties. Here, four indicators developed in reading cities are explained through defining the way: connectivity, accessibility, spacing and meshing. These allow us to bring out a hierarchy of ways and revealing subsets of morphogenesis and a case study will as a part of the Tehran will be supplemented in this article. From simple rules applied locally, it is possible to develop a multi-scale complex object, the street, to analyze and characterize the way network. This object appears to be robust in space. Moreover, it enables the development through the indicators and makes a global reading of the space and highlighting its dynamic possible. The alignment that we seize through the selection of the minimum angle between arcs at each vertex is a criterion at the origin of line construction. It is also carries accessibility calculation which combines the cost of the turning (i.e. lane change) instead of the way in the network. This study demonstrates that it is possible to highlight a network structure, trace its dynamic construction, and use them from their continuously aligned lines. Observing the public transport lines drawn within cities (existing or proposed), it can be noted that following the superstructure lines is put forward by the meshing, or the most accessible ways. Some other diagonal or transverse ones play a very special role in the second place. This supports the fact that the cost of running is not negligible. The urban planner’s decisions are in agreement with places providing rapid transfer to the rest of the network identified by our indicators. In addition, in guiding the planners, this work is capable to combine geographical and historical dimensions for interpretation of the dynamic model of space expansion at different scales.